The promise of a brighter tomorrow starts with what you build today. Nothing embodies this principle more than the construction industry. The United Architects of the Philippines’ CONEX 2015 gathers some 2,000 architects and design professionals to discuss “Sustainable Construction”, in a three-day convention currently being held at the SMX Center Mall of Asia, from April 16-18, 2015. Among the exhibitors taking part in this NELTEX, the leading Plastic Pipe Manufacturing Company in the Philippines. “NELTEX has always been a firm advocate of sustainable construction. That is why, almost 60 years now, we have been constantly innovating our products to offer the country the best solutions to meet not just the present needs for housing, working environments, and infrastructure, but also the demands of a Sustainable Future,” notes Ms. Gladys Avila, Brand Officer of NELTEX. Recently, NELTEX launched the “XV: Xtremely Viable” campaign which highlights the growing role of Sustainable Plastic Piping Solutions in building Water, Sewage, and Electric systems. “When people hear Construction, they think of wall color, tile design, steel bars, cement and even toilet bowl designs. It is often taken for granted that behind every working faucet, every speedy internet download, or plugged in electrical device--whether inside a home or in a high rise building--there are Plastic Pipes that make these daily activities happen.” she adds. Seeing the Xtremely Viability of the 8 inch PowerGuard8055 Impact Modified PVC Electrical Conduits with POWERLOCK seals, the people behind the NAIAEx AT Grade applied this specification for the use in the underground electrical feeder lines that will power the 4 major locators of PAGCOR City facing historic Manla Bay. 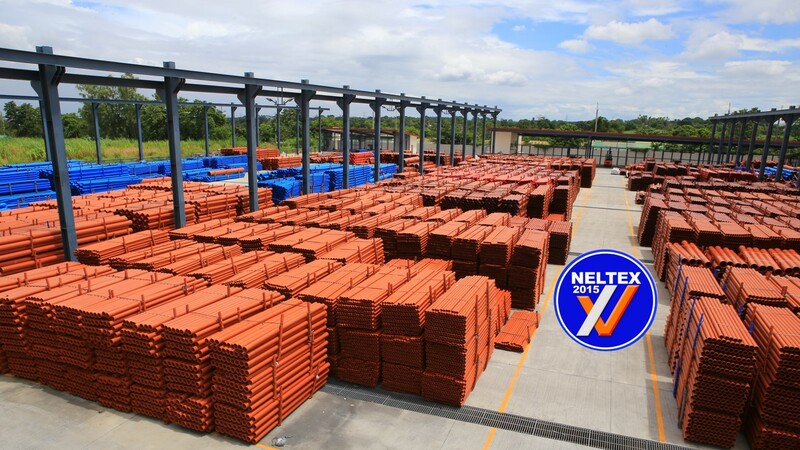 NELTEX 's specification was favored due to its non-corrossive, water proof and fire retardant qualities over HDPE or metal conduits that take cost more money, are longer to install and are prone to corrosion. Moreover, the usage of the Impact Modified PowerGuard8055 ensures the site engineers that the pipes supplied would last beyond the installation's design life while the usage of POWERLOCK gaskets ensure that the electrical system would be water tight for more than 50 years. Ensuring Cleaner and Safer Environments with 100% Leak Free System Sewer Collection Lines. The Designers of the Gaisano Mall in Ilo-ilo also chose to go Xtremely Viable when they drew up their Project’s Main Sewer Collector Pipe. Because of this, they hold the bragging rights to be the First Users of the country's Biggest PVC Pipe to date, the NELTEX SEWERGUARD 500mm with Sewerlock. This first and revolutionary product from NELTEX makes use of a machine-installed gasket made of Engineered Natural Rubber that is homogenously bound to stiff glass reinforced PP ring. The result is a 100% leak-free piping system that is also easier and faster to install, without the dirty business associated with the installation of concrete pipes. As the holder of the largest water concession in the Philippines, Maynilad has to ensure Sustainable Water Supply to their concession area through the reduction of NRW (Non Revenue Water). To help facilitate this, Maynilad have applied the NELTEX Specification of using only PVC Pressuremains with Machine Installed Fixed Seals. Compared to loose gaskets which are installed in dusty and dirty job sites. The NELTEX Specification of PVC Pressuremains with Machine Installed Fixed Seal (PRESSURELINE) makes use of Engineered Rubber-Plastic Composite Gaskets that are machine installed in the controlled confines of the factory shop floor. This guarantees that each PVC Pressuremain Joint formed is free from the variability of dust, dirt and human error. In addition to good jointing, NELTEX PRESSURELINEs are also heavy metal-free! “Unlike most pipes that are only lead-free, NELTEX PVC Pipes are guaranteed to be free from Mercury, Cadmium, Tin and other heavy metals that will adversely affect the health of those who are exposed to them.” Ms. Avila explains. These three are just some of the projects NELTEX is most proud of. In the words of Ms Avila, “at the end of the day, we just want to serve our customers with economically viable solutions to their construction needs while at the same contribute to nation building. To us, it is Xtremely Viable to live in an environment where we don't have to worry about pipe leaks or contamination; where we shouldn't be bothered by heavy traffic due to the repair of inherently faulty concrete systems or floods due to the clogging of the same faulty concrete pipes. And just as their pipes are joined together, we here at NELTEX believe that the key to CONSTRUCTING SUSTAINABLY is for Developer, Designers and Builders to align to the same values & specification towards the common good. Click here to learn more about XV. Your interest will also get you a chance to win an iPad mini. To join the LEARN, SHARE, WIN an iPAD Raffle contest. Click this ta Rafflecopter giveaway o earn entries.